Mr. Rogers stated that FHWA and DOTD have concurred that the term functional replacement is now being replaced with Mitigation based on the loss of research ability. 1) Complete relocation of the research facility to research property they own down in Red River Parish. He said his rough estimate for full relocation would be ~$5 – $7 million. The current research station property would revert back to the State of Louisiana. 2) Purchase contiguous property in an amount that would establish entirely new research plots on the newly acquired property… during the meeting we roughly figured ~40 - 45 acres. Federal Highways legal department is reviewing alternative one. The benefit to this is although there will be a ~$5 – $7 million relocation cost there would be no right of way cost associated with this parcel due to it reverting back to state ownership. DOTD has agreed to this. Following federal legal review an agreement will be drafted between all parties (LSU – DOTD – FHWA). The port agreement will be used as a template since it has undergone scrutiny and approval by all parties. Michael Baker is updating some field work and will then finalize the EIS. The Final EIS should hit the streets for review around the December-January time frame and we should have a ROD 30 – 45 days following. Mayor Walker asked to clarify if the property for relocation was in Red River Parish or if it is actually in Bossier Parish along the Red River at their existing facility. Mr. Petro stated he would check on that but he recalled it being at their facility in Red River Parish. Mr. Rogers stated that all of this has caused a roughly 5 year delay with the environmental work and receiving a ROD on I-69 SIU 15. This in turn leads us to the next item on the agenda. Mr. Rogers started the discussion with some background on the Inner Loop Extension and its history including the initial study performed by the City of Shreveport (copy available on the table). 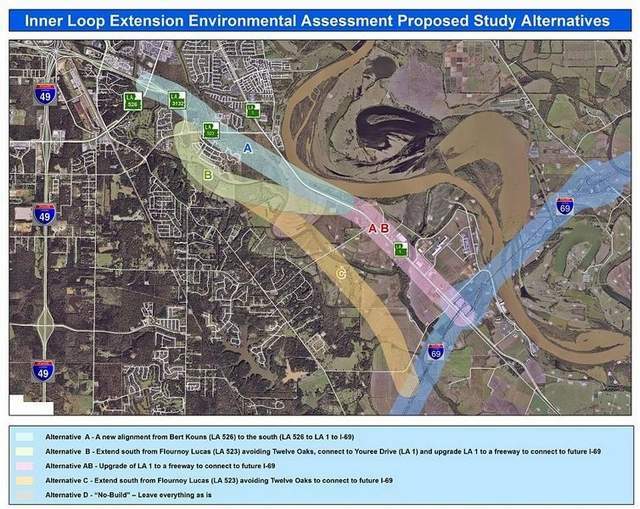 Mr. Rogers noted that this study had looked at many alternatives to completing a controlled access loop around the Shreveport Bossier urban area. When I-69 came to light the group then commissioned an I-69 Inner Loop Compatibility Report. This report reviewed that a major portion of I-69 SIU 15 could be accomplished through the development of the Inner Loop Extension and vice versa. At that time it was decided to focus on a two phased development of the Inner Loop Extension the first section from Bert Kouns to Flournoy-Lucas and phase two from Flournoy-Lucas to I-69 in proximity to the port. In addition, the Inner Loop Extension Study became the background on which the EIS for I-69 SIU 15 was to be developed and a gentleman’s agreement was arranged for the environmental work and construction of the second phase of the Inner Loop Extension to potentially be completed as part of I-69 SIU 15 as a connector. The environmental would begin with the issuance of a ROD for SIU 15 thereby providing the two ending points. Mr. Rogers then pointed out that with the delay in completing the Environmental work on I-69 due to the issues discussed earlier, the development of 12 Oaks subdivision to the south and east of the current intersection with Flournoy-Lucas and now with Mr. Larkin’s development to the south and west of the intersection this poses some concerns over the future Inner Loop Extension as currently laid out in the MPO Long Range Plan. Mr. Rogers then asked Mr. Larkin if he would like to express his concerns as they relate to his development. Mr. Larkin presented a map with the Inner Loop Extension superimposed over the 12 Oaks development and the surrounding area. He then described his development in the area and the expenses he has incurred to date. This included over a million dollars on the bridge crossing Bayou Pierre. Mr. Larkin stated that he had a number of studies completed towards implementation of the project including some traffic studies. Mr. Larkin then began a discussion over other potential alignments and/or ways to connect the port facility and I-69. These options included using Flournoy-Lucas and La 1 since Flournoy-Lucas is nearing completion of the expansion to 5 lanes and La 1 is 4 lanes with median from that point south to the port facility. Mr. Rogers pointed out that technically since the I-69 compatibility study was done that the plan and model show the alignment more of a straight shot towards I-69 and port connection. Mr. Larkin noted that a traffic study he had completed showed that Flournoy-Lucas and La 1 should be able to handle any future traffic for many years. Mr. Larkin continued to emphasize the need to remove the alignment shown due to impacts on the surrounding properties. He noted that current property owners would need to disclose this potential alignment on future sales of property. Mr. Rogers pointed out that technically they should be doing that now. Mr. Larkin stated that he knew for a fact that these land owners did not know of this potential alignment and were not made aware of it through current land sales. Mr. Larkin then discussed his request for access to Flournoy-Lucas in the area of current control of access to the Inner Loop and the proposed extension. Again Mr. Larkin referenced a traffic study he had completed and noted the study concluded that the access would not impact traffic flow through the area and that the design of the intersection and with the 5 lanes of Flournoy-Lucas there was plenty of capacity to handle the traffic. Mr. Altimus asked Mr. England for the ports perspective as related to the inner loop and I-69. Mr. England described that the port felt that with the extension of Inner Loop to Flournoy-Lucas and with the expansion of Flournoy-Lucas to LA 1 these facilities could handle the volumes of truck traffic for a number of years. Mr. England stated that the ports long range connection is with I-69 and its river crossing. He further stated that the port was putting its eggs in the I-69 basket. Mr. Altimus then asked Mr. Sanders for the opinion of the DOTD district office. Mr. Sanders noted that again the long range plan reflects a controlled access loop around the area. By directing traffic to Flournoy-Lucas and La1 you are in effect giving up on that controlled access facility. Although it may currently handle the traffic there is still potential for other developments along Flournoy-Lucas. Mr. Sanders state they are less concerned with LA 1 due to the levees on one side and the rail lines on the other. Mr. Sanders stated that they did not want this section of Flournoy-Lucas to become another Bert Kouns. Again Mr. Sander’s stated the need for control of access. Mr. Glover noted that he does not wish to abandon control access concept just to look at other alignments and other means to do so. Mr. Glover then stated that he would like to offer the following motion. 1. The MPO rescind the approved corridor alignment for the southerly extension of the Inner Loop (La 3132) from Flournoy-Lucas Rd. (La 523) to La Hwy 1. 2. The MPO requests the removal of the roadway “control of access” along Flournoy-Lucas Rd. at it’s intersection with the Inner Loop thus allowing access to community development in the area. 3. The MPO requests access approval to the future community development as shown as Option 1 on the Traffic Impact Study prepared by Neel-Schaffer dated March 4, 2011. 4. A study be undertaken to investigate the feasibility of an alternative Inner Loop extension corridor northwest and east of the existing Inner Loop terminus through undeveloped property north of Bayou Pierre from Flournoy-Lucas Rd to La Hwy 1. Mr. England seconded the motion. Mr. Altimus opened the floor for discussion. Mr. Rogers asked that from a staff/technical stand point he would like the wording of the study to reflect an Environments Study. Mr Rogers also asked if items 2 and 3 would be recommendations or request because the MPO actually has no control over this. These are items handled by DOTD and that these facilities are state highways. Mr. Sanders concurred with Mr. Rogers. Mr. Altimus also state that we all understand that DOTD has final say on the access to state highways. This would be a request. Mr. Glover concurred and restated the motion for the record with the inclusion of Environmental Study in item 4. Mr. Altimus called for a vote. The motion passed with Mr. Sanders as a dissenting vote. Mr. Jambor noted that he felt that we were trying to preserve the corridor and that we need to be sure to do better for preserving what ever corridor comes forth from the environmental study. A developer's request for access to Flournoy Lucas Road near its intersection with the Inner Loop set off an odd chain of April events. Yikes! was sort of the response as the — take a breath — Metropolitan Planning Organization Transportation Planning Committee calculated the $15 million cost to plow through those upscale houses, while Mayor Cedric Glover counted the lost property taxes. So the committee, led by Glover, killed the corridor. Never mind that an MPO staffer noted that the preferred route since 1992 actually would miss Twelve Oaks. Instead of intersecting with Louisiana 1, the preferred route would more closely brush Larkin's high-end development on its more southerly route toward a hoped-for intersection with the dreamed-of Interstate 69. The goal: complete a controlled-access loop around Shreveport-Bossier City ... So without the hope of an Inner Loop continuing south, some now see Flournoy Lucas doomed as the permanent "industrial" loop for heavy traffic traveling to and from the Port of Shreveport-Bossier ... Of course the chief mistake, in fact a bureaucratic and leadership mystery, is just how a couple of major subdivisions were allowed to not just deflect, but perhaps kill, the path of a 19-year-old Inner Loop corridor. Two words, Shreveport MPO/NLCOG: CORRIDOR PRESERVATION. Why the city allowed the subdivisions to get in the way of the Inner Loop extension in the first place is a major concern. If they are going to downgrade the proposed interchange at Flournoy Lucas Rd., then they might as well downgrade the entire section E of I-49 to expressway/arterial status...or go back to Plan A and complete I-220 through Barksdale AFB. Or...just do as I originally recommended and dump I-69 between Carthage and Monticello and reroute through US 425/US 165 to I-10 E of Lake Charles, and use the US 59 corridor to Texarkana for the Texas segments. The Inner City Connector segment of I-49 is more important, anyway. Shreveport Councilman Michael Corbin ... offered one of the best big-picture assessments of this planning dysfunction episode. "We just went through a master plan process. If we block off transportation access to I-69 and to the port, if we're short-sighted just for the promise of property taxes (from new housing development), that's not in the spirit (of the process)." The bottom line, he said, "We've got to get a corridor and protect it." If you want to design a system that can give the illusion of planning without the fuss and bother of follow-through, look no further than Shreveport and Caddo Parish. Taxpayers spent millions to extend the Inner Loop from Bert Kouns Industrial Loop to Flournoy Lucas Road only to leave the four-lane highway hanging. The Loops's next leap south is suspended in a concrete freeze frame, its path clouded by development. I hope this mess is not a preview of process for I-49 Inner-City Connector. ... [Shreveport City C]ouncil members will consider calling a meeting for public input into the future extension of La. Highway 3132 in southeast Shreveport, an area experiencing high-end residential growth. A 1992 study mapped out a proposed path for the continuation of La. 3132 that would connect with the Interstate 69 corridor. The planned route now includes more than 40 homes within the Twelve Oaks subdivision, which Glover estimated would cost more than $15 million to acquire. The Office of the Mayor has suggested redirecting the route of the extension to the northeast. The meeting is unscheduled but will be at LSU-Shreveport ... [City Councilman Michael] Corbin, who represents southeast Shreveport, said he's gotten more phone calls and emails about the situation than anything else since his council term started in November. He compared the trickle of information to removing an onion's skin. "Every time you peel back another layer," Corbin said, "there's another layer behind it." Whatever happened to "right of eminent domain"? The LaDOTD needs to grow a pair and just tell these developers to get ready for the highway and get over themselves. It's not bothering the LaDOTD to destroy a downtown Shreveport neighborhood to build I-49. So what if these are new homes in the way of LA 3132 are new and the downtown area is not...it hasn't bothered them before. It's not destruction if the neighborhood in question (Allendale) actually supports the Inner City Connector and is willing to adjust to meet it. On the other hand, it's not really LaDOTD's call...if the homeowners and developers don't want to move, and they got approval from the state to build on the ROW, then there isn't much choice. I'd rather just realign the extension to fulfill the goal of continuous freeway standards, and let them use Flournoy-Lucas Road to their hearts' content. Whatever happened to "right of eminent domain"? The LaDOTD needs to grow a pair and just tell these developers to get ready for the highway and get over themselves. In the middle of the Morganza spillway? The Inner Loop may stop at its current terminus, but Shreveporters made it clear Thursday they want it to move ahead .... More than 300 — dozens wearing LA 3132 T-shirts, pointing out the highway's state-issued number — gathered at LSU-Shreveport for a public hearing on the future of the limited access highway ... But they left with few answers on how the freeway got to where it is or where it might go ... And for now, according to Mayor Cedric Glover and the state Department of Transportation and Development, there is no designated corridor for its growth .... Finding a new route will cost at least $750,000 for environmental and feasibility studies, according to DOTD Deputy Secretary Eric Kalivoda. It'll take two years .... "We're prepared to move forward with that right away," Kalivoda said. ... If you're not into daytime TV or can break away from work, you might try the 10 a.m. Thursday meeting of NLCOG's Metropolitan Planning Organization on the fourth floor of downtown's American Tower. As the controversy was erupting at the time of its May 5 meeting, the group could neither frame a motion to rescind its realignment action nor even approve its minutes from the now infamous April 7 meeting. You might want to arrive early and bring your own chair. Steps are under way to begin environmental assessments of possible corridors to serve the Port of Shreveport-Bossier and get heavy truck traffic off Flournoy Lucas Road. And there was talk about safeguarding potential routes. Rare event. Larkin's access to Flournoy Lucas was at first turned down by the state for safety considerations for being so near a major interchange — the off ramp of Highway 3132. That the state subsequently rescinded its "control of access" standard to allow a curb cut, apparently is rare, if not unprecedented. Local transportation engineers advised against the access but were overruled in Baton Rouge. Alternate route. Twelve Oaks developer Tony Janca advocated a new corridor that would circle south of his development toward state Highway 1 as a quicker, cheaper solution to getting truck traffic off Flournoy Lucas. The extension also could open other areas to development and further entice a supermarket that would like to build near Twelve Oaks. Among the obstacles: the tight fit of going over a rail line at Highway 1 then avoiding the Red River levee. Trucks or no trucks. We're not convinced of the argument that the arrival of Interstate 69 near the port would mean relatively few trucks on Highway 3132 and thus make it less cost effective. There still would be local truck traffic servicing the port. And wouldn't the completion of Interstate 49 to Arkansas bring traffic from the north?" With the approximate two-year environmental process on the Extension corridor just starting, it is now possible that ground may be broken on I-69 SIU 15 before the Extension (although both are in distant future, if ever). "Status Update I-69 SIU 15 ... Michael Baker is updating some field work and will then finalize the EIS. The Final EIS should hit the streets for review around the December-January time frame and we should have a ROD 30 – 45 days following ... "
Thought it would be as good a time as any to start an I-69 Louisiana thread [since it is the beginning of the thread, here is a link to a map of SIU 14 (Haughton to El Dorado AR) ... (http://www.i69arkla.com/images/RevisedPreferredAlternative(1454%20x%202046).jpg)]. The Final EIS for SIU 14 has been standing ready to print for some while now. We will get the approval for release when we are given final clearance from the US Corps of Engineers on the delineation of wetlands and concurrence on the Preferred Alternative. The ROD is also ready to release once any edits that may come from the Corps are applied. The ROD will be issued following the 30 day comment period for the EIS. Finding a new route will cost at least $750,000 for environmental and feasibility studies, according to DOTD Deputy Secretary Eric Kalivoda. It'll take two years .... "We're prepared to move forward with that right away," Kalivoda said." A group of northwest Louisiana officials this afternoon unanimously approved a $1 million study to examine the completion of Shreveport’s Inner Loop ... The Northwest Louisiana Council of Governments’ transportation committee will use $800,000 in federal funding to examine three routes for Highway 3132’s southward extension toward the future Interstate 69. The state will contribute $200,000. The committee handles regional transportation planning. A: Abandoning the section of 3132 that now runs from Bert Kouns Industrial Loop to Flournoy Lucas Road. The new piece would head from Bert Kouns to Highway 1. B: Extending 3132 from its current terminus at Flournoy Lucas and curving eastward toward Highway 1. C: Continuing 3132 from its current terminus and heading more directly south to connect with I-69. Another option to be considered will be whether finishing the freeway is practical ... The feasibility study should be done by Dec. 31, according to NLCOG. After that, a reporter that would consider environmental effects would take another year-and-a-half. I have recently received communications from both LaDOTD and TxDOT regarding the current status of Louisiana's portion of I-69 SIU 16 from US 171 to the Texas state line. On January 3, 2011, TxDOT submitted a request for the Federal Highway Administration (FHWA) to rescind the Notice of Intent (NOI) to prepare a Tier One Environmental Impact Statement (EIS) for the I-69/Trans-Texas Corridor (TTC) Project. The limits of this project included SIU 16. At the end of 2007, FHWA and TxDOT circulated the I-69/TTC Tier One DEIS for public review and comment. Public hearings were held during February and March 2008. However, since that time, TxDOT has officially retired the TTC concept, thereby resulting in the cancellation of the I-69/TTC project and any further consideration or study of it. Consequently, there is currently no environmental study underway on any portion of the I-69 National High Priority Corridor 18 and 20 systems in Texas, including SIU 16. Also, TxDOT has no firm plans to initiate any I-69 environmental studies. Currently, TxDOT is working with local community leaders to prepare a locally focused, citizen driven plan to study and develop I-69. This plan is anticipated to be completed later in 2011. The timeline for implementing the plan, which will likely focus on identifying potential projects to upgrade existing highways to meet interstate standards as part of I-69, will be dependent upon the amount of funding that becomes available. Q: "Has LaDOTD ever proposed a tentative route for I-69 from US 171 to the Texas state line? If so, would it be possible to provide a description and/or a map of such a route?" A: "TXDOT, is in charge of preparing any planning/environmental study for I-69 through Texas and through the Stateline (SIU 16) to connect to Louisiana US 171 where SIU 15 ends just south of Stonewall. TXDOT will have to consult with LADOTD throughout the study process as to where it crosses into Louisiana. There was a Tier –One Corridor Study Draft EIS put out to public review by TXDOT in late 2007. The corridor was several miles wide. The DEIS was rescinded in 1/3/2011 and the document was pulled from the TXDOT website. There was no route chosen or decided. As of now, they are focusing on upgrading existing highways to meet interstate standard." Q: "Also, TxDOT''s I-69 Segment One Committee is currently studying the possible I-69 route to the Louisiana state line. Are there currently any types of coordination efforts between TxDOT and LaDOTD regarding the state line crossing? If so, does LaDOTD currently have a "preferred" routing?" A: "Right now due to limited funding, TXDOT has no plan to restart an EIS for I-69 that crosses into Louisiana. Again, if and when they do, TXDOT will have to consult with LADOTD on what is the preferred route going into Louisiana. There is no “preferred route” for LADOTD at this time as the environmental study for SIU 16 has not been initiated. In short, the section from the Texas state line to US 171 will not be built during my lifetime. Good. The whole diagonal across Louisiana and Arkansas seems rather pointless. It does seem like it would be much more economical and time-efficient to expand upon TxDOT's current efforts to upgrade existing roads for I-69 and use Anthony's similar notion for Louisiana and Arkansas up to Monticello. Maybe keep the portion of SIU 15 that would complete the Shreveport Inner Loop. If a direct Memphis-Shreveport highway is deemed useful, it can start out as a four-lane upgrade of US 79, perhaps with a connection to present I-69 via a new bridge over the Mississippi or the US 49 corridor. Then in the future, if traffic warrants it, on-the-spot upgrades can be done. This would probably be more direct than the zigzagging I-69 plan. -- The US 59 upgrade between Laredo and Texarkana (possibly as I-41 or I-47), with US 77 from Corpus Christi to Brownsville upgraded as an extension of I-37 (the remaining segment of existing I-37 to CC would become an I-x37 connector, while the segments of SH 44 and US 77 connecting with US 59 could be upgraded as standalone freeways (or as I-x41/I-x47)). -- And, the third branch would be the proposed I-69 extension from Memphis to Indy, which would remain as planned. 'Course, I'm a bit biased in this, since I've been pushing for a Lake Charles/Alex/Monroe/Monticello freeway for the longest. "The Final EIS for SIU 14 has been standing ready to print for some while now. We will get the approval for release when we are given final clearance from the US Corps of Engineers on the delineation of wetlands and concurrence on the Preferred Alternative. The ROD is also ready to release once any edits that may come from the Corps are applied. The ROD will be issued following the 30 day comment period for the EIS." The comment period ends November 10. Nov. 10 Texarkana Gazette article indicates that the Texas I-69 Segment 1 Committee should be ready to send its draft report to the state next month (you have to pay for article). At a recent meeting, added to the list of recommendations was a closer working relationship with Louisiana to determine the state line crossing. Kent Rogers, Executive Director of NLCOG, was quoted as commenting that Louisiana residents are also local to the Segment 1 project and that it currently seems like they are being shut out of the process. It may be possible that the process in Texas will also lead to a proposed route for I-69 in Louisiana from the state line to US 171. But while motivations and aims might be discounted, the truth remains that southerly corridors to serve the Port of Caddo-Bossier were steadily compromised during the last decade by the Metropolitan Planning Commission and the Northwest Louisiana Council of Governments. But the La. 3132 case offers unpredictable wrinkles, such as a key residential developer also being a member of the Bossier City Council. The public also may find it odd that the only vote against an April 7 measure to reconsider corridors came from the transportation panel's most knowledgeable road expert, the district administrator for the state highway department. Further questions were raised by the involvement of state lawmakers as go-betweens with key officials in Baton Rouge. Yes, restoring public confidence will take some effort. NLCOG's response to the 3132 Coalition's additional requests for key memos and emails related to the project can help begin repairs. NLCOG also should be alert for any opportunity to assure transparency, whether selecting hearing times or better publicizing meetings. Big lessons for the public? Pay attention and show up. A ROD has not yet been issued for SIU 14. I've communicated with a local FHWA official and it appears that the major holdup/problem is that neither Louisiana nor Arkansas has any funds allocated for I-69 SIU 14 in their respectives STIPs. If a ROD were to sit dormant for a certain length of time, a re-evaluation would have to occur before any construction could begin. The various governmental entities are currently trying to figure out the best way to handle this situation. In the FEIS, Louisiana set forth a schedule to build its section of SIU 14 over a fifteen year period from 2019 to 2033 (page 5-7 of FEIS; page 207/760 of pdf). Maybe it is better to wait on the ROD. This article includes a video report about the Jan. 24 Inner Loop Extension public meeting. LA 3132 Coalition seems convinced that NLCOG and influential power brokers do not want the Extension to be built. Related to the LA 3132 Coalition suspicion, a public records access lawsuit was recently filed on behalf of the Coalition. A public meeting on the future of Louisiana Highway 3132 was filled with contention and mistrust, but a common thread of public opinion for a final route came through the clutter. The meeting, which was changed from a public hearing format the day before, was held in a format many attendees were displeased with. Most had expected a chance for individuals to voice their concerns over the highway project. Instead, 15 tables of seven to eight people were established. Each table was given a laminated map of Highway 3132 and the surrounding area, some markers and about 20 minutes to draw their most favored end route for the highway. After the maps were drawn, group leaders discussed their tables' consensus for about three minutes before the crowd. "The idea is to get 15 different maps, not 300," said Jacob Loeske, regional operation manager for Highway 3132 contractors Buchart Horn Inc. "This is their chance to provide their opinions to us." The groups were diverse, some hosting ordinary area residents and major players in the project at the same table. But by the end of the meeting, most of the groups had agreed: from the current terminus of Highway 3132, the extension should go south to Bayou Pierre and between the edge of the Esplanade development and the Twelve Oaks subdivision. Not building the extension is not an option. One voice from the Coalition to Finish 3132 reminded the audience — when he wasn't being hushed by the meeting's host — they'd been here before. "It's 2012 in America, and this process should not be allowed to continue the way it has," demographer and coalition member Elliott Stonecipher said. "This process has never yielded a road. None of the Northwest Louisiana Council of Governments' process have." Stonecipher echoed the project back to 1969 when it began and told the crowd to be wary of promises the highway would be complete this time. Loeske reminded Stonecipher it was a public meeting, not a public hearing and his time was limited to three minutes. "He can have my three minutes" was the crowd's chorus. The meeting notes from the Texas I-69 Segment Committee 1's November 9, 2011 meeting were recently posted on the TxDOT website. The notes include the following points about coordination with Louisiana, including a desired state line crossing north of Logansport, LA. [page 3/31 of pdf]. • The Shreveport/Bossier City area has been successful in securing money for projects such as I-49 in the past. • Committee member William Holley spoke with citizens of the town of Logansport and a crossing of the Texas/Louisiana border, north of Logansport, is preferred. • The committee chair suggested that TxDOT coordinate closely with LaDOTD to tie to the national I-69 route. • Roger Beall explained that the process under way in Texas is a high level grass-roots planning process and it does consider the Louisiana National Corridor tie-point near Stonewall. • A question was asked regarding the use of existing roadways in Louisiana. Kent Rogers explained that the alignment in Louisiana is a combination of both existing roadway and new alignment. • Connections are important, to the interstates, I-20 (Marshall relief route), I-30 (Texarkana relief route) and the I-69 national route (Joaquin/ Tenaha relief route). It is interesting that Rogers is quoted as stating that Louisiana's alignment is both existing roadway and new alignment. My understanding is that SIU 14 and SIU 15 are both all new terrain routings. Perhaps the preliminary thought in regard to SIU 16 is to upgrade LA 5 between Logansport and Keatchie (and possibly some part of US 171 from Gloster to Stonewall)? Another early implementation possibility could be to direct TxDOT to initiate coordination with Louisiana and proceeding with the connection to the I-69 national route. • The final Environmental impact Statement (EIS) for the National Section of Independent Utility (SIU) 14 from El Dorado, AK to Shreveport, LA has been distributed for public comment. A Record of Decision (ROD) may be issued 45 days after close of public comment. • National SIU 15 from Shreveport, LA to near Stonewall, LA final EIS will be distributed for comment late December 2011 or early January 2013.